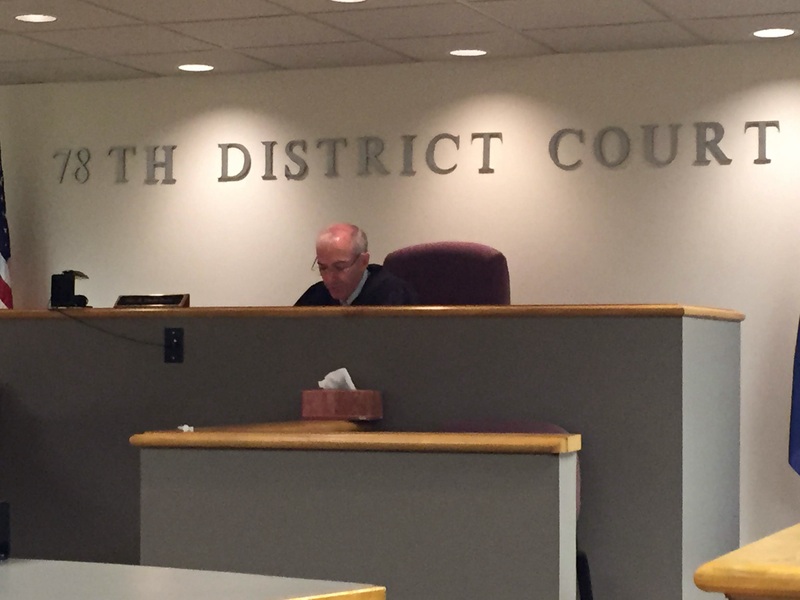 78th District Court sentencings, posted April 11, 2019. The Honorable Judge H. Kevin Drake of 78th District Court. – Matthew Aaron Eitniear, 34, of 711 Arthur Rd., Rothbury, was found guilty April 8 of marijuana possession and was sentenced to nine days in jail; six months probation; one year discretionary jail for one year; driver’s license suspended 180 days/restricted after 30 days; and $350 in fines and costs. – Rebecca Paulette Jonas, 44, of 6176 Leonard St., Coopersville, was found guilty April 9 of operating while impaired and was sentenced to 93 days discretionary jail for one year; outpatient treatment; and $1,105 in fines and costs. One count of operating with a high blood alcohol content (BAC) was dismissed. Conviction reportable to the Secretary of State (SOS). – Timothy Charles Zeller, 35, of 926 S. Dennis Rd., Ludington, was found guilty April 9 driving while license suspended (DWLS) and was sentenced to one year discretionary jail for one year and $465 in fines and costs. Conviction reportable to SOS. – Angela Marie Alltop, 43, of 1588 E. Hammett Rd., Hart, was found guilty April 8 of food stamp fraud $250 or less and was sentenced to 93 days discretionary jail for one year; credit for one day served in jail; $2,110 in restitution; and $500 in fines and costs. – Ericka Ann Garcia, 38, of 611 S. Water St., Hart, was found guilty April 5 of allowing a person to drive in violation and was sentenced to 90 days discretionary jail for one year and $290 in fines and costs. One count of operating without insurance was dismissed. – Richard Allen Hayes, 29, of 1481 S. Oakwood Dr., White Cloud, was found guilty April 4 of allowing a person to drive in violation and was sentenced to 90 days discretionary jail for one year and $290 in fines and costs. Charges of operating without insurance and DWLS were dismissed. – Theodore James Westbrook, 34, of 5670 S. 142nd Ave., Rothbury, was found guilty April 5 of allowing a person to drive in violation and was sentenced to 90 days discretionary jail for one year and $300 in fines and costs. Charges of operating without insurance and DWLS were dismissed. – Jorge Alberto Cesareo, 19, of 11910 Hall Rd., Ravenna, was found guilty April 5 of allowing a person to drive in violation and was sentenced to $290 in fines and costs. One count of operating without insurance was dismissed. – Gloria Vela-Diaz, 38, of 2448 W. Cleveland Rd., New Era, was found guilty April 5 of driving with an improper license and was sentenced to $100 in fines and costs. Conviction reportable to SOS. One count of DWLS was dismissed. – Willard Benton Dold, 20, of 1959 N. Young Rd., Hart, was found guilty April 5 of allowing a person to drive in violation and was sentenced to $290 in fines and costs. One count of failure to yield to an emergency responder was dismissed. – Brandon Scott DeWeerdt, 34, of 1527 N. Oceana Dr., Hart, was found guilty April 5 of allowing a person to drive in violation and was sentenced to 90 days discretionary jail for one year and $290 in fines and costs. One count of operating without insurance was dismissed. – Mikayla Nichole Wilson-Gleason, 24, of 648 N. 136th Ave., Hart, was found guilty April 5 of failure to report an accident and was sentenced to 90 days discretionary jail for one year and $400 in fines and costs. – Kimberly Kay McCombs, 52, of 2768 W. Winston Rd., Rothbury, was found guilty April 4 of improper license and was sentenced to $300 in fines and costs. Conviction reportable to SOS. – Bianey Ortiz, 42, of 521 N. Oceana Dr., Shelby, was found guilty April 4 of violating a learner’s permit and was sentenced to $150 in fines and costs. Conviction reportable to SOS. – Peter Jay-Antonio Brown, 43, of 14520 Ashton Rd., Detroit, was found guilty April 4 of motor vehicle fuel tax act violation and was sentenced to $215 in fines and costs. – William David English, 19, of 953 E. Adams Ct., Muskegon, was found guilty April 4 of operating an unregistered vehicle and was sentenced to $125 in fines and costs. – Maritza Lopez, 40, of 430 Harvey St., Shelby, was found guilty April 4 of allowing a person to drive in violation and was sentenced to 90 days discretionary jail for one year and $290 in fines and costs.